Published By – Bewlay Bros.
White cassette shell with blue on body print. Catalogue number OC 264-64 773 can be found on the rear insert flap. 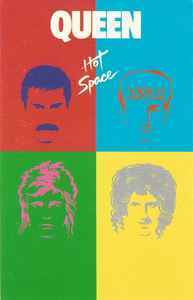 * ["Under Pressure"] Queen Music Ltd. / EMI Music Publishing Ltd. / Bewlay Bros. / Mainman S.A. / M.C.P.S. Raincloud Productions Ltd. / David R. Jones / Mainman S.A.